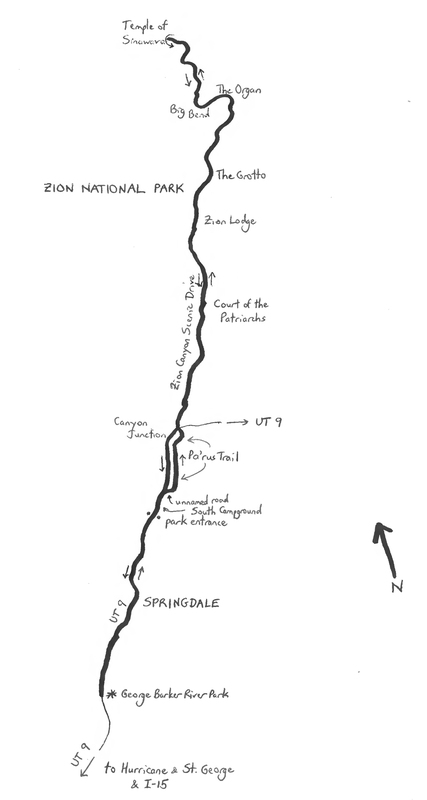 The Zion Canyon Ramble is a nifty but dense 19.8-mile, out-and-back ride from Springdale to Zion National Park and back, in southwestern Utah. The ride is “dense” in that the route is chock full of outstanding, monumental scenery. The net climbing is 664 feet. Although the ride is relatively short, taking your time to enjoy the scenic views, perhaps even stopping a few times, is highly recommended. Start the ride at George Barker River Park in Springdale, conveniently located along Zion Park Boulevard, also known as Zion – Mount Carmel Highway, and also known as Utah State Highway 9 (UT 9). The park is located on the right side of the road, just outside of Springdale’s main retail district (at 1751 Zion – Mount Carmel Highway). Exit the park and turn right onto UT 9. Prepare for some slowing as you ride through the town of Springdale. The traffic volumes cannot be attributed to local Springdale, which had a small but growing population of 570 in 2016. Rather, with 4.5 million visitors annually, as of 2017, traffic volumes heading in and out of Zion can be heavy, particularly during certain seasons. Zion was the third-most-visited National Park in the U.S. in 2017, trailing only the Great Smoky Mountains and Grand Canyon. Springdale itself is a picturesque town, nestled along a fork of the Virgin River, with scenic backdrops. But, the real scenery is up the road, in Zion. The ride starts at an elevation of 3,809 feet, at George Barker River Park. 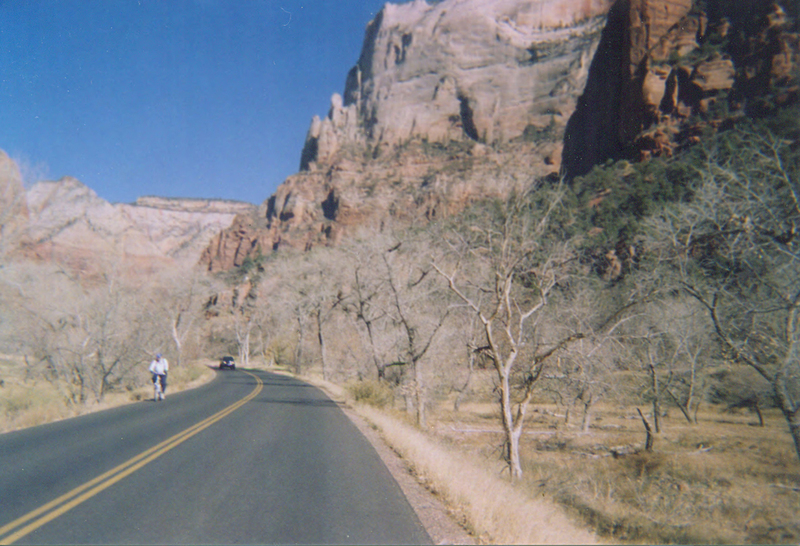 Head toward Zion on UT 9; it is a gradual climb, with a couple of rollers, as you head through town. Just beyond the two-mile mark, pass a small parking area on the right – this is a dropoff zone for Zion, for those who prefer to hike in. It was otherwise a $35 entrance fee for most motor vehicles as of this writing. Bicycles are not exempt (nor are pedestrians), with a $12 fee. The entrance pass is good for seven days, so you can come back! (That’s seven consecutive days, unfortunately). After entering the park, ride past the parking and camping areas on the right. At mile 2.75, turn right onto the unnamed road, followed by a left turn onto Pa’rus Trail. Trail? The trail is actually a wide, paved path that is a pleasant alternative to riding or walking along the road. The trail meanders adjacent the Virgin River’s North Fork, crossing it several times. The river may be seasonably dry. Pass under UT 9 at mile 3.75, and then emerge onto Zion Canyon Scenic Road. Cross over to the other side of the road, and continue heading north. Although the scenery thus far has been spectacular, the experience becomes majestic, as the road enters the Court of the Patriarchs. There is a trailhead here. To your right are the Twin Brothers, and to your left, maybe out of view, are The Sentinel and the Altar of Sacrifice. Admittedly, among the attributes of Zion are the majestic names of the park’s features, all of which add to the mystique of the experience. The road continues to climb gradually, as you pass Mount Moroni to the left, and Zion Lodge on the right. The lodge is an actual lodge, rather than a natural feature. You are now 6.3 miles into the ride. The canyon narrows north of the lodge, with Red Arch Mountain on the right, followed by the Great White Throne, and Mount Majestic on the left. There is a picnic area and trailhead along here. The canyon continues to narrow, as the road enters The Organ (mile 8.3). The experience is that of riding into the bowels of a great pipe organ, with the road twisting to the left, and then to the right, all with limited sight distance, except for vertical (up), and the prospects of ascension. There are trailheads at Weeping Rock and Big Bend, just off the road. The slot canyon effect follows you as leave The Organ, and gradually enter the Temple of Sinawava, also known as The Pulpit. The road ends here (mile 10.0), in Zion’s all-natural version of surround sound, where sheer walls nearly encircle you. From here, Riverside Walk (hiking trail) continues up the narrow canyon to the north, toward more of Zion’s features. If you can, park and lock your bike, and take a short hike, before heading back. The return ride reverses the outbound route. The only exception is to skip the Pa’rus Trail on the way back, and stay on the road. Given that the prevailing direction is downhill on the way back, your speed may be a smidgen too high for comfortable riding on the path. Thus, keep straight on Zion Canyon Scenic Road at the Pa’rus Trail, remaining on the road. At UT 9, turn right; the road curves to the left and heads south, toward the park exit, and on into Springdale.